At the recent England trials 4 of our U15 West Midlands Champion Boys team and 1 of the Girls (also WM Champion team) were selected to be part of their respective 24 strong Cadet (U17) squad. At the recent England trials 4 of our U15 West Midlands Champion Boys team and 1 of the Girls (also WM Champion team) were selected to be part of their respective 24 strong Cadet (U17) squad. Boys: Callum Parsons; Yan Naydenov; Daniel Howe and Sebastian Smith. With Tyler White retaining his place from last year giving Redhill School 5 potential male players earning England caps. Meanwhile Carla Hulme was also re-selected from a pool of 90 on trial for the Girls making that a truly “Super Six”. 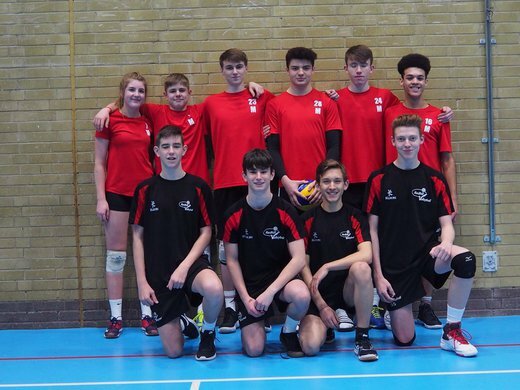 Amazingly this follows on from 2017 when Redhill volleyball provided 4 players for England at the NEVZA Championships in Denmark. This year David Hodson; James Ledbury ; Andrew Pearson and Harrison Martin-Lawes have moved on to the England Junior (U19) ranks seeking to add to their 11 caps at U17 Level. Beginning with no volleyball experience until year 7 at Redhill they have worked incredibly hard. Having decided on a path they are committed to it, sometimes training 4 times a week. Playing National League travelling the length and breadth of England at weekends. We wish them every success. Representing your country is the ultimate honour for any sportsman or woman. These talented, hard working and focussed youngsters now have the opportunity to reach that goal. They have passed stage one –to get in the squad. Now comes the hard work to make the England team.